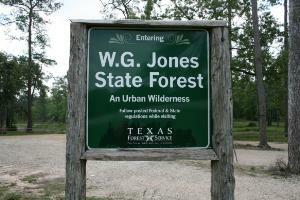 This is the sign to the W. G. Jones State Forest. W. Goodrich Jones State Forest is a large rectangular plot of forested land that has trails running along the perimeter as well as several trails criss-crossing the interior. Most of these trails are straight, so the trails are laid out in a grid. It feels like a street map in a way and there are "street signs" at the corner of each trail intersection. The majority of the W. Goodrich Jones State Forest is south of FM1488, but there is a section to the north of FM1488, too. This northern section contains the Sweetleaf Nature Trail which I hiked a couple of months earlier (you can read my log of that location here). There is a small parking lot on the south side of FM1488. There are a couple of small ponds, but otherwise there's not a lot to see other than a lot of trees. On the northern side of FM1488, there is a section for the red-cockaded woodpecker, an endangered species. I didn't see any of them, but I did hear a lot of them. The trails are not only for hiking, but for equestrians, joggers and mountain bikers. I recently purchased a GPS, so this hike was my first opportunity to test it out and become familiarized with it. I took a rather circuitous route so I could cover the majority of all the trails. I have uploaded the .GPX file. Not a great hike in terms of scenery, but a good place to get some distance in.